The Shot 16 Healthtechon International Conference on SMART HOSPITALS OF TOMORROW held in India on 3rd and 4th of March 2016 showcased emerging and unique healthcare technology innovations. This year’s event was attended by eminent leaders, international speakers, hospital owners, investors, doctors, architects, designers and hundreds of healthcare delegates. 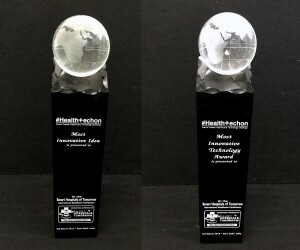 Awards were presented at the Healthtechon Awards ceremony and TAHPI was nominated in three categories in competition with 15 other companies. 1st prize for the Most Innovative Technology Award. TAHPI is very proud and honoured to accept such highly regarded awards.